Save $1,200 per couple on certain cabin categories of this river cruise when you book and pay in full. Click here for eligible departures. Our Hospitality Desk will be located in the hotel for your convenience between 3:00 p.m. and 7:00 p.m. It is here that our friendly staff can assist with everything from general questions about your upcoming voyage to reserving Premium Shore Excursions. An American Queen Steamboat Company representative, as well as a local representative, will be readily available to provide you with dining, entertainment, and sight-seeing suggestions so that you may maximize your time in Minneapolis. This nonprofit art museum and educational center opened in July of 2006 to help showcase and recognize the Winona area for their culture and art. The museum originally featured a collection of traditional marine paintings and folk art. Today, the museum holds pieces of art that potray the history of American Europe including styles such as Impressionism, Luminism, Realism, Modernism, and Contemporary. Founded in 1935, The Winona County Historical Society is comprised of three museums. The Willard Brunnell House, located in local southern city, Homer, the Rural Heritage Museum at the County's fairgrounds in St. Charles, and finally, the main museum, the History Center, which houses the Society's offices and the Laird Lucas Library and Archives. The History Center is the largest County Historical Society in the state of Minnesota. It showcases three floors of exhibits and is where the Society often hosts regular programs and events. The modern, yet rustic building is filled with Winona's 1915 Armory and the contemporary Laird Norton Addition, designed by Joan Soranno, which has won several design awards. Artifacts of early Polish culture are displayed in the old Laird Norton Lumber Company building that employed thousands of Polish men working in riverfront sawmills. Explore the collections dating from the 1850s depicting the lives of these early settlers. A must see is a historic Solidarity banner with signatures of world leaders. The gift shop has Lubiana pottery exclusive to North America. The Dahl Auto Museum celebrates the Dahl family’s involvement as automotive dealers spanning over 100 years and five generations. It also features the history of the automobile through the eyes of the Ford Motor Company, an extensive mascot collection and many beautifully restored classic automobiles from the turn of the century to present. Approximately 20 antique and classic cars are on display to highlight each decade from Dahl Automotive’s inception in 1911. To incorporate historic La Crosse, the museum also features a re-creation of the Starlite Drive-in eatre. The shape of this immense and beautiful chapel symbolizes attributes of God. The high ceilings represent a God who transcends the finite world while the shape of the nave, transepts and sanctuary form a cross, acknowledging an immanent God who has been with humankind even through suffering and death. At the entrance of the chapel, just above the door, a relief of Moses before the burning bush is showcased. Admire bronzed statues, symbolic paintings and sculptures, stained glass windows and mosaics. This beautiful Victorian house is filled with nearly all of the original furnishings, making it stand out from many other historical homes. The construction of the home began in 1858 by lumber baron Gideon Hixon, who featured beautiful woodwork and ornate interior decoration. His wife, Ellen, is responsible for the decoration of the home, who chose the late Victorian/Edwardian style, accenting rooms with “Turkish Nooks.” It is listed on the National Register of Historic Places. Riverside Museum exhibits chronicle the history of La Crosse, concentrating on the Mississippi River and its importance to the area. Exhibits range from prehistoric artifacts and cave drawings to logging, rafting, and the Pearl Button Process. A large collection of artifacts from the steamboat “War Eagle” are on display and a PBS Video about La Crosse is shown. La Crosse enjoys thriving relationships with sister cities, business partners, students and people from around the world. To celebrate the success of these partnerships, and build a tribute to the culture and traditions, the township decided to create a garden filled with the flowers and decorations closely resembling a garden that could be found in each one of these sister cities. In the Chinese Gardens, principles of Feng Shui are showcased as rock, soil, water, architecture, and plants are harmoniously and meticulously to create a free flowing movement, just as they would be arranged in ancient China. In the French Garden, finely trimmed plants, granite statues, and elegant fountains are arranged in a formal and geometric pattern, recreating the sophistication and romance found in France. The German Garden is adorned with colorful hydrangea, roses, and fruit bearing shrubs, which set a vibrant contrast to the Rock Garden and pergola. Inside the Norwegian Garden, many waterfalls trickle past luscious rhubarb, strawberry, and blueberry plants creating an pleasantly aromatic environment. Conclude the day at the casual Russian Garden, with tree-filled groves, an elegant “Basedka” structure centerpiece, and beautiful sculpture focal points. Conclude the day at the casual Russian Garden, with tree-filled groves, an elegant “Basedka” structure centerpiece, and beautiful sculpture focal points. This beautiful Romanesque style church is characterized by thick walls, heavy columns and round arches for windows and doors. On foundations 32 inches thick, the walls are built of enduring Bedford limestone from Indiana. Each stone was cut by hand and if one looks carefully, imbedded fossils may be seen. Inside, the original organ from 1897 has been restored and is once again functioning, murals are displayed, and impressive wood-work. The church is most noted for its large collection of Tiffany stained glass windows, which have been called, “one of the five finest Religious Tiffany Collections in the world.” Explore the history and art of the church as an expert guide leads guests through the expansive church explaining some of the most interesting facts. The Dubuque Museum of Art is the oldest cultural institution in the State of Iowa and was founded over 140 years ago as the Dubuque Art Association. Inside is a permanent collection of over 2,200 works concentrating on 20th-century American art with an emphasis on American Regionalism and artists connected to the Tri-State area. This includes works by Grant Wood, Arthur Geisert, and the complete collection of Edward S. Curtis’ The North American Indian, which is also part of a traveling exhibition program. The Fenelon Place Elevator is described as the world’s shortest, steepest scenic railway, 296 feet in length, elevating passengers 189 feet from Fourth Street to Fenelon Place. The railway was constructed in 1882 for the private use by a wealthy local banker and former state senator, J.K. Graves. See a view of the historic Dubuque business district, the river and three states. Cable Car Square offers guests three blocks of boutiques and specialty shops. From the home and garden stores to apparel and accessories to a fair-trade retailer, this district has bit of everything to satisfy shoppers’ needs. Make sure to enjoy the coffee and sweet treats shops, as well as a store where you can sample homemade peanut butter! The original structure, four stories high, was called the Waples House and was named after its owner, Peter Waples, a wealthy Dubuque merchant. It was the first building visible to the travelers entering Dubuque from across the Mississippi. The Waples House was furnished extravagantly and was known far and wide for its gourmet cuisine. Now, over 100 years later, after a $33 plus million interior renovation and exterior restoration, Hotel Julien Dubuque has redefined elegance through the blending of its rich history with modern luxury and style. Dubuque’s historic Grand Opera House is the oldest and grandest of more than 16 legitimate theaters that served the community prior to 1900. In 1889, W.L. Bradley, Jr. and other local businessmen invested $100,000 to create this iconic landmark. The architect, Willoughby Edbrooke, selected the Richardsonian Romanesque style and chose red sandstone and Dubuque brick for construction. The 1,100 seat auditorium included 2 balconies, 8 boxes and stalls, and a proscenium large enough to host major theatrical productions. Today, the theater is still used by the community and the productions continue to amaze guests. Discover one of the marvels on the Mississippi River! The Quad Cities combines the cultures of Rock Island, Moline/East Moline in Illinois and Davenport, Bettendorf in Iowa. This fun and friendly area is home to hundreds of music, food, and art festivals. Blues, jazz, rock, and many other music stylings can be found not only at the festivals, but also at music venues in the downtown areas. Museums that tell the history of the area and feature international and national traveling exhibits will also keep you busy, as over 20 museums are scattered throughout the Quad Cities and feature everything from Buffalo Bill Cody and German immigration to fine art collections, and Native American Indian history. Come for a visit and experience Quad Cities on the mighty Mississippi River, their Midwestern hospitality will make you feel right at home! Isabel Rose Scherer was raised in the city of Davenport and began her artistic lifestyle early. In the early 1930s Isabel attended Grant Wood’s Stone City Art Colony where she learned how to carve limestone sculptures flawlessly. Her legacy lives on in the city of Davenport as her art pieces and influences are seen throughout the city, as well as her protégé, Donna Young, who works to help preserve Bloom’s legacy. During the one-hour-and-fifteen-minute guided tour, enjoy behind-the-scenes access to every step in the making of each Isabel Bloom sculpture. During the tour, discover how this company maintains the legacy of artist Isabel Bloom. Get a glimpse of some of her original art and photos and learn how her innovations still influence what we do today. As a remembrance of the tour, shop the gift shop where you can purchase exclusive sculptures available only to tour guests. This gigantic glass building on the banks of the Mississippi, designed by British architect David Chipperfield, is home to one of the Midwest’s finest art collections, and hosts world-class traveling exhibitions. Its studios, auditorium and spacious lobby are alive with art classes, lectures and special events that attract visitors of all ages. Tour the facility touching in nearly every style of art, spanning across the world, from classical to modern. Founded on August 1, 1994 as a private, not-for-profit organization, the German American Heritage Center (GAHC) seeks to preserve the heritage of German speaking ancestors for present and future generations and to enrich the knowledge of the German immigrant experience. Today, the heritage center has evolved into a museum that includes a large permanent exhibit and two rotating special exhibits. Within the permanent exhibit, visitors enjoy an orientation theater, six education stations, and two restored hotel rooms. Guests enjoy an interactive experience as they learn about immigrants’ journey by sea, train and foot, to their final destination at the German American Heritage Center building, which was originally a very busy hotel for thousands of immigrants in the 1860s. Explore this award-winning Sun Garden with blooms of exotic tropical flowers, a 14-foot waterfall, and reflecting pools. Outdoor gardens feature magnificent conifer collections, thousands of spring bulbs, colorful and rare perennials. This stunning botanical center hosts extravagent festivals, parties, and events. Be certain to explore the gift shop before you depart. Explored in 1673 by Pere Jaques Marquette and Louis Joliet, the land that is now Des Moines County changed hands from France to Spain, back to France and finally to the United States as part of the Louisiana Purchase. After Lt. Zebulon Pike’s expedition landed at what is now Crapo Park in 1805, it was part of several territories – Louisiana, Indiana, Missouri, and Michigan. In 1834, residents named the land “Burlington” after trader John Gray’s Vermont hometown. When Iowa was named a territory in 1838, Burlington remained the capital. Today, visitors enjoy the sights and attractions of the town as the hills and valleys, prairies, and the Mississippi River create the perfect scenic backdrop. The Museum opened in 2009 in the former Burlington Public Library, which was built in 1898. There are nine galleries on three levels in the Museum, each one addressing a different aspect of county history. The 19th Century Gallery illustrates the growth of the small frontier territory into a lively and bustling city of the gaslight era. The 20th Century Gallery on the upper level displays changing exhibits that address the events and social changes of the 1900s. Military, agriculture, and music are all also showcased throughout the museum, as they are all very influential and important aspects of the county’s history. William Garrett, an early Burlington merchant, built a home at the top of the hill overlooking downtown Burlington and the river in 1851. As his family grew and his business became successful, Mr. Garrett enlarged and remodeled the house in 1870. Three generations of his family lived in this home through many tragedies and triumphs. The interior showcases the furnishings and belongings of the Garrett and Phelps families who lived here for more than 100 years. The ballroom on the third floor features Medical Memories, which highlights the years this home served as the first Protestant Hospital. Walk around this exclusive gallery to view the unique medical instruments, uniforms, and photos of that time. A grand and beautiful asset to the city. Burlington, Iowa’s 1937 movie theater was once the center of activity in a bustling downtown. The Capitol Theater shut its doors in 1977 and faced the wrecking ball within the next decade. Luckily, it was spared and fully restored to its opulent form. Today, films and live performances are still being offered here, and visitors can admire the beauty of this historical piece of Burlington. The Port of Burlington Welcome Center has vast amounts of information on this area as well as the rest of the state. A scenic plaza area on the east side of the Port showcases the Mississippi riverfront. An outdoor stage located at the south end of the building is the site of Burlington Steamboat Days American Music Festival, which attracts crowds in excess of thousands of visitors every third week in June. Explore the unique gift shop, The Iowa Store, to pick out the perfect souvenir of Burlington. The store offers a wide selection of one-of-a-kind trinkets, jewelry, and art pieces handcrafted by local artists! This famous winding street received its name from Ripleys’ Believe It or Not in 1940 when Robert L. Ripley saw the limestone and blue clay street in person. The Alley, constructed in 1894 with intensions to link the downtown district to the shopping area on North Sixth Street, consists of five half curves and two-quarter curves with a 58 foot drop over a distance of 275 feet. If you’re feeling brave, take a walk down the “crookedest street in the world” and our motorcoaches will pick you up at the bottom of the alley to continue your tour. This Hannibal gem is packed with more toy trains than you have probably ever seen. Enjoy authentic replicas as they move swiftly along the tracks or learn the history of the models and the trains they are made after. As you walk around, relive your childhood and learn the stories of the railways’ past as you view some authentic memorabilia. This included tour visits seven buildings, five of which are listed on the National Register of Historic Places and two that are highly interactive museums showcasing fifteen original Norman Rockwell paintings! Learn about the Hannibal of Samuel Clemens’s childhood and explore the stories created through the powerful imagination of American icon, Mark Twain. Building 1: Interpretive Center – Here, explore interactive exhibits highlighting the stories and life of Samuel Clemens. Building 2: Mark Twain’s Boyhood Home & Garden – See the home where Clemens was raised, and where the adventures of Tom Sawyer took place, along with the home’s lovely gardens. Building 3: Boyhood Home Gift Shop – The original museum, which was built in 1937, now houses a gift shop offering Twain’s books. Building 4: Huckleberry Finn House – The childhood home of Tom Blankenship, the model for Huck Finn. Building 5: Becky Thatcher House – The home of Laura Hawkins, the inspiration for Becky. Building 6: J.M. Clemens Justice of the Peace Office – The location where Sam’s father held court. Building 7: Mark Twain Museum Gallery – This lovely two-story building features interactive exhibits, the Norman Rockwell Gallery, and treasured Clemens family artifacts. Live performances occur throughout the day at specific times. Tom & Huck Statue – Located at the foot of Cardiff Hill and offering a perfect location for a photo! For more than 150 years, the Sanctuary of Trinity Episcopal Church, designed by architect Joseph A. Miller, has stood the test of time. With an interior consisting of a deeply arched heavy wooden beamed ceiling, beautiful bronze lanterns and side wall lamps, an impressive pipe organ and 18 illustriously conceived stained glass windows, Trinity Church is truly a historic marvel. As you step into the church, you are immediately transported back into time and enveloped by Hannibal’s past. Early church members commissioned well-known artists to design the Sanctuary’s beautiful stained glass windows. With signature designs by Charles Booth, Emil Frei, Jr. and the Louis Comfort Tiffany Glass Company, these windows are truly remarkable in their diverse artistic style, thematic construction and conceptual execution. A fun place to meet other people and relax while enjoying local wine, beer and light snacks such as cheese and crackers! Take a self-guided tour through Hannibal’s newest attraction! There is over 10,000 Square feet of artifacts which allow you to relive historic, pop culture moments. This museum also features over a dozen vintage cars, arcade games, 100’s of signs & posters, movie props jukeboxes and so much more! Through interactive exhibits, artifacts and historic photos, the Hannibal History Museum tells the story of Hannibal’s remarkable past with exhibits including the founding of Hannibal which showcases how the New Madrid Earthquake and the failed settlement of Marion City affected the fledgling river town of Hannibal. Other exhibits include Antebellum Hannibal, Hannibal’s Civil War, the Lumber Barons, The 20th Century Industry, The Art of Architecture, the Prominent Hannibalians and so much more! Enjoy a complimentary city tour of Memphis, Tennessee. During this exclusive narrated driving tour of Memphis, you will see such landmarks like Sun Studio, The Peabody Hotel, National Civil Rights Museum and a cruise past Beale Street. Included is a Graceland Platinum ticket! After a guided tour of the Graceland Mansion, enjoy self-guided tours of the rest of the outlying museums. Experience Memphis through the eyes of The King himself on an exclusive experience through this musical southern city. Join us as we embark on a driving tour passed select landmarks such as Sun Studio, iconic Beale Street and Elvis Presley Plaza. Keep a sharp eye out for wondering musicians as this tour may have a couple musical surprises as we make our way to Graceland. Visit this musical mecca with a Platinum Ticket to Graceland Mansion and all of the outlying museums. Enjoy a self-guided tour of Graceland and enjoy free time for lunch on your own at one of the Elvis themed eateries on the grounds. During this exclusive narrated driving tour of Memphis, you will see such landmarks as Sun Studio, the Peabody Hotel, the National Civil Rights Museum (The Lorraine Motel) and St. Jude's Children's Research Hospital. Experience the most musical town in the world when you cruise down Beale St known as the "Home of the Blues & Birthplace of Rock & Roll." You will see Elvis Presley Plaza, BB King's Blues Club and the Gibson Guitar Factory. Included is a Graceland Platinum ticket, which is a Self-Guided tour that includes the Graceland Mansion, all of the outlying museums with extra time to treat yourself to a lunch fit for a King at one of Graceland’s Elvis themed eateries. You will not want to miss this unique and authentic city tour, which pays homage to the legendary musical giants who called Memphis home. Memphis is a city built on melody from the jazz dives and blues clubs of Beale Street to the Memphis Rock 'N' Soul Museum, Gibson Guitar factory, Sun Studio and the famous Stax Museum of American Soul Music. In a city of contrasts, the tragic but uplifting stories of the National Civil Rights Museum are balanced by the frivolity of the twice-daily march of the ducks at the Peabody Hotel. See the complete story of Memphis music history, as researched by the Smithsonian Institution. This museum tells of the musical pioneers and legends of all racial and socio-economic backgrounds who, for the love of music, overcame obstacles to create the musical sound that changed the world. Is a significant location in the city’s history as well as in the history of the blues. Step into the center for Southern Folklore, a non-profit organization that show cases and celebrates the culture- the foods, the music, the arts, the traditions, and the stories of the South. AutoZone Park is home of the minor league baseball team, the Memphis Redbirds. The Peabody Hotel is a luxury hotel in Downtown Memphis; it is well known for the famous “Peabody Ducks” that live on the hotel rooftop, but make a daily trek at 11:00 AM to the hotel’s lobby in a “March of Ducks” celebration. More than a century ago, music began pouring into Memphis, Tennessee. Musicians of all races and backgrounds came together and, for the love of music, created a sound that changed the cultural complexion of the world forever. America’s music exploded out of Memphis. Today, the Memphis Music Hall of Fame honors many of the greatest musicians of all time, who created this city’s musical legacy, and who shook our planet to the core! The Mississippi Delta is more than a geographical region. It is a way of life - a true cultural experience based around agriculture, music and history. These small river towns have been the inspiration for authors, musicians and artists for centuries. 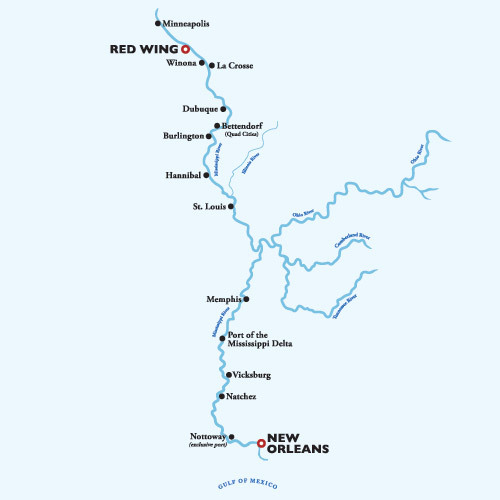 Lower Mississippi River voyages include a unique glimpse into a Port of the Mississippi Delta. In 1716, the French built Fort Rosalie overlooking the Mississippi River. In 1823, a mansion was built by a wealthy cotton planter on land north of the fort. The Mississippi State Society Daughters of the American Revolution have since gained ownership and have been maintaining the house and grounds since 1938. On this self-guided tour, discover the history of the house and the artifacts found throughout. Period-dressed docents can be found throughout the home to answer questions and to provide more information! Guests can explore the extensive gardens, gift shop, library, and carriage as well. Enjoy a short, 20-minute video in the Visitor’s Center Theater and hear about the history of Natchez. Then, explore the building at your leisure. At the entrance, a scaled display model of the city is showcased. Stop in the office for some general information and questions about the town and its history, including town highlights and points of interest. William Johnson was known as the “Barber of Natchez”; he began as a slave and gained his freedom at age eleven. After his freedom, he began to work his way up in society, eventually becoming almost fully accepted within society. As the town barber, William Johnson was able to hear the stories and gossip of many of the residents, which he documented in his diary for over 16 years. His 3-story brick home was built in 1840 and showcases many original furnishings. This Greek Revival Mansion was built in 1858. The house was built before the breakout of the Civil War in town but did suffer some damage – a cannon ball was launched into their kitchen! It is now fully restored – the main floor offers a showcase of many antiques and furnishings and the upper floors offer a costume collection located in the Historic Clothing Museum. Tour the house and then stop in the gift shop for some souvenirs. Irish Immigrant and cotton merchant Frederick Stanton built this Palatial Greek Revival mansion in 1857. It was appraised at $83,000 during that period, even before it was furnished. Take a 30-minute tour of the house – which takes up the entire block and is fully furnished. Afterwards you can stop for lunch in the Carriage House Restaurant, known for their fine southern cuisine. Step off the motorcoach and walk through the front gate leading to the second floor porch of this 1789 building – the oldest structure in the city of Natchez. Join us for an exclusive tour of the King’s Tavern – a newly opened restaurant and bar, owned by Regina Charboneau, a nationally known chef, and her husband Doug. Enjoy an exclusive tour of the distillery, followed by a guided tour of the bar, located just next door, with a complimentary custom drink. Here, learn the history and culture of the African Americans over time. The museum will delve into the 300-year-old African American history, spanning four lifetimes from Colonial and Cotton Kingdom Natchez, to the Reconstruction and the Civil Rights Movements. As you explore this creative portrayal of the true African American story, you will unfold history to reveal Natchez in a light that is shown nowhere else around. AUTHENTIC AMERICA ON THE MIGHTY MISSISSIPPI - Have you ever wondered what this country looked like to its early explorers and pioneers? Traveling on the Mississippi and its tributaries aboard the elegant American Queen, you will be transported back in time to an era of leisurely and romantic travel. Storybook American towns and vibrant, bustling cities combine with the sweeping panoramas and deep blue lakes which inspired the works of Mark Twain. Authentic America is out there just waiting to be explored and after two weeks cruising amidst the Antebellum charms and gracious style of American Queen, you will forever be changed. Port taxes of $399 per person are additional and not included in the prices shown above.